I have listed a very rare Breyer to EBay. 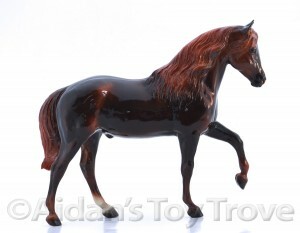 Breyer produced a very small number of these Glossy Liver Chestnut Paso Fino’s. I will personally guarantee the authenticity of this model. Even if you aren’t interested in bidding, do check out the auction. This is one really beautiful horse! You can view the auction by clicking on the photo above.